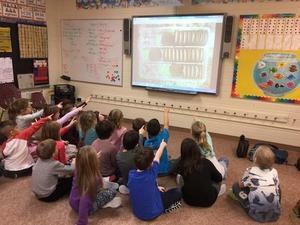 Three schools, 19 teachers and 275 students participated in a unique program to improve teaching methods for problem solving in mathematics and numeracy. Throughout the 2017-2018 school year, École Beausejour Early Years School (ÉBEYS), Oak Bank Elementary (OBE) and Springfield Middle School (SMS) rolled out a new approach to help students make better real life connections in math and problem solving. Allan Stevenson, Sunrise School Division’s Numeracy Program Leader, visited each of the schools for two 5-day residencies over the fall and winter seasons. The residencies introduced teachers to new theories and learning practices and gave them the opportunity to observe Stevenson modelling lessons in the classroom firsthand. Teachers then had the chance to consolidate the learning that took place and set goals and strategies to implement the theories introduced. The program concluded with a final daylong forum where all participating teachers had the chance to express their thoughts on the program and how to sustain the methods they learned over time. While each school took a customized approach to introduce the new teaching theories and practices in their classrooms, Marian Small’s “Open Questions” was used as an anchor resource to support many of the learning strategies. The project aimed to celebrate mistakes as opportunities for growth and empower students through productive struggle and perseverance. To learn more about numeracy-problem solving residencies, please contact Allan Stevenson, Numeracy Program Leader Kindergarten to Grade 12, astevenson@sunrisesd.ca.